Contrary to the doomsayers and financial analysts, who keep knocking the company and its stock down, steadily growing global economy, increasing trade and expanding labor force are growing demand for air travel. Boeing forecasts global airline passenger traffic to rise by around 5% per year through the next 20 years. Boeing anticipates the global airline fleet to rise from around 21,000 airplanes currently to over 42,000 by 2033. After accounting for airplanes that will retire during this period, the company forecasts that airplane makers will deliver 36,770 airplanes to airlines worldwide. Boeing commercial airplane product portfolio is more extensive and better positioned, than Airbus. Together these two companies control the majority of the global commercial airplane market. The difference in the portfolios of these two airplane makers stands out most in the wide-body segment, which includes airplanes that seat more than approximately 230 passengers. In this segment, Boeing offers more airplanes than Airbus. Starting with the 787-8 Dreamliner, it seats 240 passengers in a typical three-class seating arrangement. Boeing offers three variant models of its 787 Dreamliner, three variant models of the 777 and two 747 variants that comprehensively cover the entire wide-body segment. In comparison, Airbus with its A330, A350 and A380 models, does not cover the entire wide-body segment comprehensively. The A330 and A350 models from Airbus provide strong competition to Boeing’s 787 Dreamliner and the smallest 777-8X model. However, Airbus is yet to produce a competitor to Boeing’s 777-9X which seats approximately 410 passengers in a three-class cabin. The A320 neo is another step closer to taking flight. The first aircraft is designated MSN6101 in the company’s numbering system is powered by Pratt & Whitney PW1100-JM engines and is the first in Airbus A320 neo family developmental fleet. It is equipped with extensive flight test instrumentation for handling quantities, performance and engine tests, along with high-altitude and hot-and-cold-weather campaigns. In total, Airbus’ NEO flight test fleet will comprise eight aircraft. This includes two A320 neos, one A319 neo and one A321 neo for each of the new engine choices: Pratt & Whitney’s PW1100-JM and the CFM International LEAP-1A. Swedish company Braathens Aviation has told Bombardier it no longer wants to be the launch operator of the CSeries 100s . Bratthens’ domestic unit, Malmo Aviation, said it was the planned launch operator. But in its second quarter/first half financial results statement, Braathens said “increased uncertainty” about the CSeries program and the possibility of a further delay of entry into service has prompted it to reconsider. “An engine-related incident on one of the CSeries test aircraft was reported by Bombardier in late May. It has subsequently emerged that this may cause another delay to the CSeries introduction. We have informed Bombardier that we will not assume the role of formal launch operator of the aircraft type. Due to increased uncertainty, we are discussing other possible changes to the aircraft delivery schedule with Bombardier,” Braathens said. Finally Bombardier returned the aircraft into the air on September 7th after a 100-day grounding with FTV-2. The GE9X engine for the Boeing 777X aircraft will feature fewer and thinner composite fan blades than any GE wide-body engine in service. To do this, GE is designing a new composite fan blade using next generation carbon fiber composite material. The new material incorporates a higher stiffness carbon fiber and new epoxy resin. The leading material will also be modified from titanium to steel alloy to further enhance the blade’s strength. Last year GE engineers received positive results from material testing on full-sized GEnx blades. Testing of the new material continues in preparation for next year’s testing on the new GE9x blade design. Southwest Airlines put a new paint job on its planes, adding a splash of bright color as it enters middle age and faces many changes. The airline introduced its new livery on Monday September 8th, during an event in a hanger at its headquarters next to Dallas Love Field. Blue is still the dominant color, but the planes will also have red, yellow and blue swooshes on the tail and wing tips. Southwest calls it ”Heart One”. 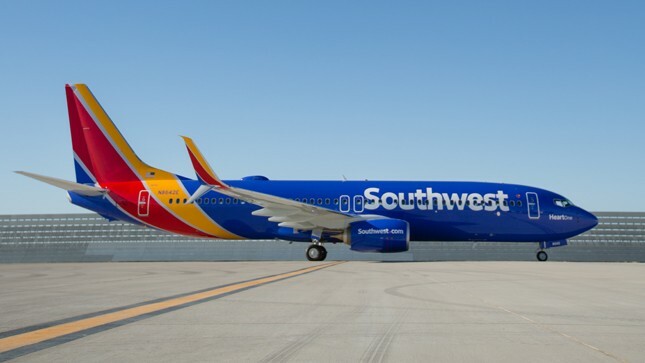 The change comes in a year during which 43-year-old Southwest has begun international flights, expanded in New York and Washington, D.C. and is freed from longtime government limits on its Dallas Schedule. 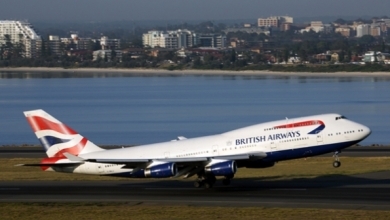 British Airways is rolling out cabin upgrades across 18 of its Boeing 747-400s, which will be equipped with improved inflight entertainment and modern interiors. The cabin refresh, which will be performed by British Airways’ engineers in Cardiff, will bring the aircraft more in line with its A380s and 787s. Universal power sockets and USB points will be installed throughout the World Traveller Plus cabin, plus the curtains and carpets will be replaced in both World Traveller and World Traveller Plus. Philippines conglomerate San Miguel is reported to have signed a USD$1 billion deal to sell its stake in Philippine Airlines (PAL) back to Tan, the group from which it bought the stake more than two years ago. San Miguel and a group owned by billionaire Lucio Tan have signed an agreement of intent to complete the sale, Reuters news agency reported a person with knowledge of the matter as saying. The deal covers the conglomerate’s industry held shares in the airline,equal to nearly half of the carrier, plus loans and advances. The agreement is subject to conditions set by San Miguel, including delivery of the total payment amount of USD$1 billion in a week, said the person, who spoke on condition of anonymity. San Miguel owns 49 percent of the parent of listed holding company, PAL Holdings,that in turn controls around 90 percent of the airline, which has a market value of about USD$3.4 billion . 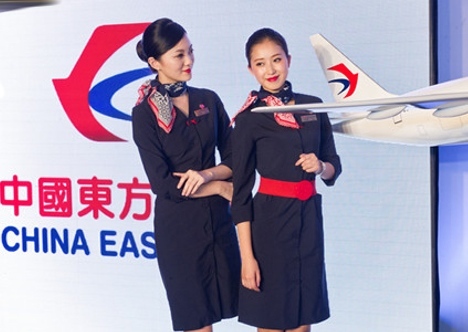 China Eastern Airlines has unveiled a new look after 25 years, which includes a new logo featuring the shape of a swallow consisting of two capital letters, C and E, the initial of the carrier’s name. The design retains the red and blue colors on the carrier’s original logo. Chief designer Liu Tao said the new logo uses more curves and circles compared to the old one, giving a more international flair. The Shanghai-based carrier said the new logo and paint job will be applied to a Boeing 777-300 ER to be delivered during this month. China Eastern is scheduled to take delivery of four 777-300ERs this year and will introduce 10 more between 2015 and 2016. By 2018, it is expected to have 20 of the type,more than any other carrier in China. The carrier will operate the 777-300ERs on transpacific routes between China and North America, which will be a major market for China Eastern over the next three years. Intrepid Aviation and KfW IPEX- Bank have closed a commercial financing transaction for one Airbus A330-300.The aircraft was delivered on Aug.30th and was leased to Cebu Pacific. Ryanair has taken delivery of the first of 180 new Boeing 737-800 Next Generations on order. 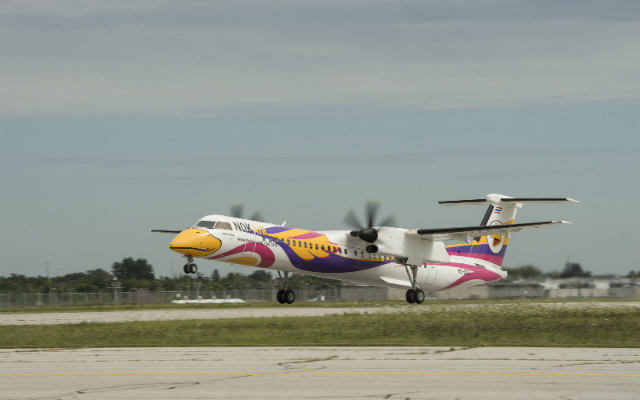 Nok Air takes delivery of the first high-capacity Q400.Nok has firm orders for six Q400s. Jiuyuan Airlines Chinese low-cost start-up Jiuyuan Airlines has taken delivery of its first two aircraft as it gears towards launching operations. Irkut MC-21 Russian deputy Prime Minister Dmitry Rogozin has announced the Irkut MC-21 will begin flight tests in April 2016. Ryanair European low-cost carrier commits to order 100 737 MAX200 that can accommodate 200 seats. Air New Zealand on September 12th, AirNew Zealand retired its last 747 with a flight from San Francisco to Auckland. Atlas Air Worldwide Holdings announced adjusted net income of US$15.9 million (11.8 million euros) for the second quarter, compared with US$20.4 (15.2 million euros) for the second quarter of 2013. Profitability in Atlas Air’s ACMI business reflected an increase in 747-8F revenue, but revenues were affected by a decline in block-hour volumes related to the return of three 747-8Fs from IAG cargo in April and early May. This decline was partially offset by the placement of two of the 8F’s with DHL Express in May, the Start-up of ACMI -8F flying for BST Logistics in February 2014 and Etihad in May 2013, as well as the start-up of ACCMI 747-400 flying for Astral Aviation in September2013. In Dry Leasing, revenue and profitability grew following the addition of three 777F aircraft in January of this year and two in July 2013, which raised Atlas Air’s 777F fleet count to six. Each of these aircraft are leased to customers on long-term basis. 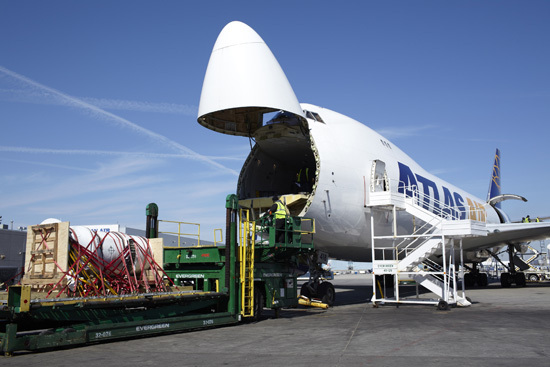 Atlas Air said air freight volumes continue to improve.